One of the founding members of Jefferson Airplane – a certified Rock and Roll Hall of Famer – shared with students at The Ohio State University the story of his journey to success. 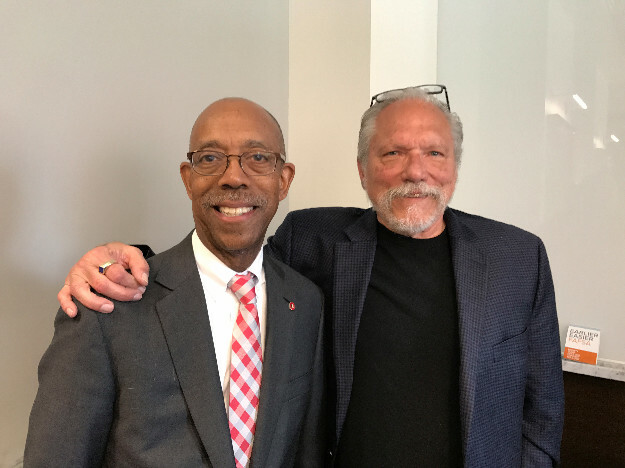 Jorma Kaukonen visited the class that President Michael V. Drake co-teaches with Moritz College of Law Dean Alan Michaels. “The Civil Rights Movement and the Supreme Court” uses the music of the period to teach students about this important time in America’s history. Previous visitors include Mary Wilson of the Supremes, who came to campus last year. Kaukonen, who grew up in Washington, D.C., as the son of a Foreign Service Officer, said he fell in love with the gospel music of the period because that is what his mother loved. “It was absolutely magical to me on so many levels, and one of the reasons was the subject material of these blues masters and these gospel masters was about real life,” he said. Kaukonen started school at Antioch College in Yellow Springs, Ohio. It was in Ohio where he learned to play guitar in the fingerstyle for which he became famous. It was where he also became an activist. He joined the protests of a Yellow Springs barbershop that refused to serve black customers. Kaukonen moved to the San Francisco Bay area in 1962 and finished his degree at Santa Clara University, something that he said has helped his music. “I didn’t get my job because I went to college, but I’m better at it because I did,” he said. Kaukonen moved on to lead the band Hot Tuna. His long career has seen him enter the Rock and Roll Hall of Fame with Jefferson Airplane while Rolling Stone magazine ranked him among the 100 greatest guitarists of all time. In 1989, he returned to Ohio to establish the Fur Peace Ranch, a guitar camp and concert venue located in Meigs County. During a Q&A, one student asked Kaukonen what inspired him. “Mostly I draw inspiration from writers these days,” he said. And what has helped him sustain his passion for music?